The first thing you have to be aware of when you go to Sarek is that you are above the polar circle in the arctic. The mountains are quite steep and there are glaciers at higher altitudes. The weather can be very challenging year round with a possibility of snow even in july and august. Wind and rain dominate the days. Out of 3 days there will be probably be 1 or 2 with rain. I was actually quite lucky with the weather with hardly any rain. Just strong wind for 2-3 days. But the last 3 days were amazing with sunshine and blue sky. The nights were cold though and I didn’t have the correct gear for it. The terrain can be quite challenging as well with multiple river crossings and swampy areas. You need to be well prepared and bring the right gear or you might end up in trouble. As always you need to work with layers to protect you against the elements. A base layer to keep you warm and transport sweat to the outside. A mid layer to keep you warm and protect against the cold. And a top layer to protect you against rain and wind. At the heart of Sarek you are about 4-5 days hiking from the first somewhat civilized place (Suorva or Aktse). This means you need to be prepared with the right clothes in case something goes wrong. I always bring a backup set of dry clothes I put in a dry bag, well hidden in my backpack. You might end up falling in a river or the rain is that bad that you get drenched. But at least you have dry clothes to put on afterwards. This mostly is a hoodie, merino wool long sleeve shirt, socks and a spare pants. A spare hat can come in handy as well. I also wrap my sleeping bag in a dry bag to be sure it doesn’t get wet in any way. So if something goes wrong you can put on dry clothes and crawl in a dry sleeping bag to warm up. I prefer a lightweight hiking pants I can unzip because I get hot easily. This way I only need to take 1 pair of pants! But most of the time you need to wear a long pants in Sarek, especially when you are down in Rapadalen. Your legs will be torn apart by the bushes and stones if you don’t wear a full pants. But on the sunny days high above Rapadalen it was lovely to walk around in shorts. The Quechua pants I took is affordable. It is not crazy quality but if you are on a budget it is a great option. It does the job and it fits pretty good! I use the base layer mostly if it gets very cold at night. Near the end of the trip I was really happy I took them because the temperature dropped below freezing at night and it was pretty cold in my sleeping bag. A waterproof rain pants is a must take for Sarek because it can get very very wet. The pants from Quechua I took did the job but it’s not very strong and it can’t handle the bushes and rocks very well. It kept me dry when it rained but I will have to find a better option for my next adventure. The Quechua Techwool merino shirts are my favourite shirts to wear for hikes. They feel very good and when it’s cold they warm you up and when it’s hot they cool you down. The quality is also quite good and they are much cheaper than the ones from the competition. I take two base layers in case it gets really cold. The Quechua Techwool 155 Long sleeve Shirt I used mostly for sleeping in and it kept me warm up for most nights except for the really cold ones near the end of the hike. I am not a big fan of down jackets so I prefer to bring a soft shell as a mid layer. They are great when it doesn’t rain (although they can handle a little bit of rain). I used it mostly at the end of the trip when the sun was out but the wind was a bit chilly. Just a base layer underneath and the soft shell on top. Perfect! The Wedze hoodie was my spare mid layer that was in my dry bag but I could also use it when it got really cold in the evenings. It wasn’t necessary but the last night in Sarek I had to wear it because it was too cold to sleep. This is one of my favourite rain jackets. It is affordable, light and sturdy. Ofcourse it’s not the same quality as the North Face or a established brand but it does a great effort in trying to offer it. The zippers are silicon sealed and there are ventilation zippers on the side for when it gets hot. The hood has a small overlay so the water doesn’t drip in your face. It’s the first time I tried double lined socks. Supposedly that prevents you from getting blisters because the two layers rub between each other and not with your skin. I didn’t get any blisters although but that’s probably because it’s mostly not a issue for me. The liner socks I mostly use for sleeping. The neopreen socks were a life saver. From day 2 my feet and shoes stayed wet all day and these socks made sure my feet stayed warm. If there is one thing I am happy about that I brought on this hike it’s these socks. I also used them in the evening to wade in the river to have a shower. Or to wander around close to my tent if I didn’t feel like wearing shoes. I didn’t expect it to be that cold already but when I arrived in Gällivare i realised i should have taken gloves. They also told me that there had been snow already so I decided to go buy some gloves at the Intersport in the city center. The Hestra waterproof gloves I bought did come in handy when it rained the first days and the wind felt very cold. I prefer waterproof gloves for Sarek like conditions because when your gloves get soaked because of the rain you get cold hands anyway. I prefer to put all my clothes into dry bags so I am sure they keep dry. Also at night when I am in my tent. You never know a storm and heavy rain destroy your tent and everything gets wet. There are many options for clothing dry bags but I just took the one from Quechua because I am a ambassador of the brand. They can be closed with velcro and are very light and easy to pack. They don’t take up much space and can be compressed as well. I had the Salomon Quest already for two years when I used them in Sarek. Up until then they proved to be very sturdy and waterproof. I used them on Kungsleden and on numourous hikes and they kept my feet dry. But Sarek is a different story. For at least 7 days my shoes were soaked and I gave up on trying to keep them dry and walked straight through rivers with them. Maybe it is because they lost their waterproof capabilities but that’s not the complete story. They are fine for rougher hikes, off-the-trail but not for longer multi day hikes with wet conditions like in Sarek. You would need stronger boots for that. This might be just my opinion but I will look into some more durable shoes for my next hike this may. My initial plan was to use the Kalenji XT6 trail running shoes to cross the rivers but after day 2 I realised it was nearly impossible to keep my other shoes dry. So instead they became my shoes to wear around camp in the evening. These are actually my shoes I use for trail running and they are a great buy if you don’t feel like spending a lot of money on trail running shoes. Especially the grip on mud and hills is quite good. On slippery rocks they don’t really do it for me. Without hiking poles it would have been a completely different story. The swamps, rocks and climbs are a mission even without a big pack on your back. While carrying 25-30 kg on your shoulders hiking poles become a necessity. I could check in front of me how deep the swamp was and they helped to balance me on the rocks. On the more straight forward parts they are handy to just keep you in a rythm. For the river crossings they are extremely useful because it is extremely hard to balance yourself while crossing a river with slippery rocks and a heavy back pack. You can also use them to check out how deep the water in front of you is. I took the Quechua 550 grip hiking poles because they are strong and easy to use with a strong grip. Affordable and durable! My eyes were fixed on the Osprey Xenith 75 liters backpack for a while already. 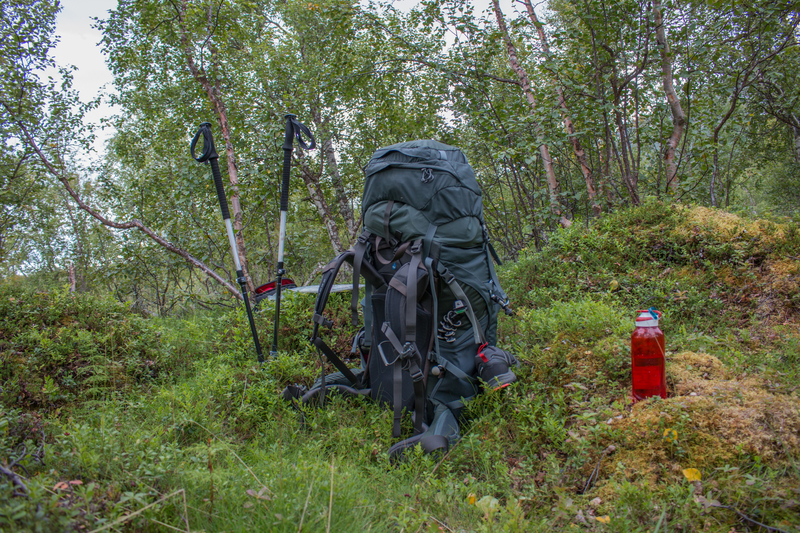 First of all I liked the design and I tried one on from a fellow hiker on Kungsleden and it felt very comfortable around the waist and in my back because of the padding. It doesn’t feel overloaded very quickly like other bags. I carried 28 kg during the first day but it didn’t feel that heavy. A comfortable backpack is essential on a long hiking trip because it can wear you down and cause injuries or sore muscles. Just make sure you adjust the weight on your hips first so it sits gently above/on them. Afterwards you can adjust the shoulder straps. This Osprey backpack is easy to adjust and everything seems of good quality. It has a curved design so it follows the arch of your back and doesn’t swing around while hiking. The downside is that you can’t completely open the front and you have to take everything out if you need to reach the bottom. Smart packing helps with this ofcourse. I got this tent from Quechua to use and review it during my Kungsleden hike. For that trip it was a great tent and it proofed to be fit for the conditions. But for Sarek it was just at the limit. It is not strong enough for strong winds. There was a storm for 1 night and the tent made so much noise and it felt like it would be blown away any minute. The storm cords are not sufficient. I had no issues with water coming in though. It was waterproof enough. 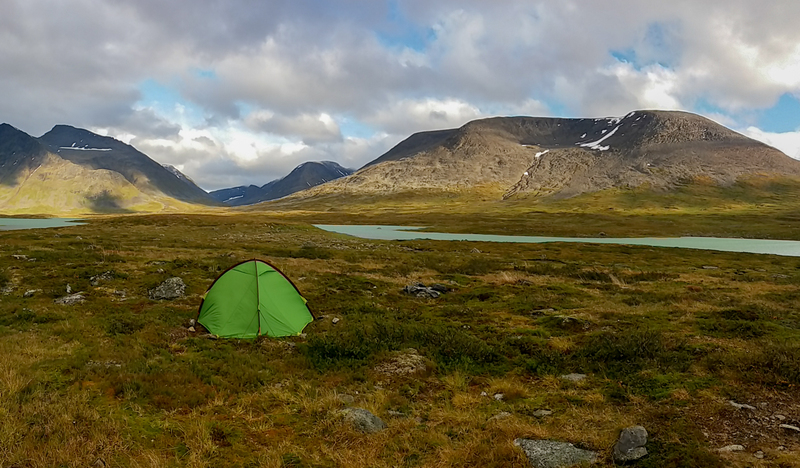 If I would be closer to a safe place it wouldn’t have been a big issue but I was in the middle of Sarek and that’s not a good place to loose your tent. I can’t imagine what would have happened if the storm was worse. But don’t get me wrong, this tent is a great buy for your regular long distance hiking trips but not just for the real into the wild stuff where you need to really rely on your gear. I bought this sleeping bag in REI in Anchorage during my Alaska trip in 2014. It can handle temperatures upto -2 degrees. But by the time I used it in Sarek it already lost quite a bit if insulation capacity. It was fine in the beginning but when the temperature dropped to near freezing and below I noticed it couldn’t keep me warm anymore. It also got quite damp because of condensation. Down hates condensation! Because of this I was quite cold the last two nights and I could feel the weak spots in my sleeping bag where the cold got in. This was a bit risky because I would get hypothermia. I woke up as soon as it was bit light and hiked to the top of Skierfe to get warm. So for Sarek I advice to take a sleeping bag that can go to at least -5 or even beter -8 if you plan to go outside july and august. Even then it can get quite cold at night so be prepared and maybe take a liner that helps you win some extra warmth. Also try to air and dry it out a bit every morning so it can breath a bit and the down can get in the right places again. This is a affordable lightweight sleeping mattress but it is more for spring and summer treks. When it got really cold near the end of my trip I could feel the cold coming from beneath. I am looking into getting a new mattress I can use for colder weather. More info on that when I get back from my upcoming trip to Norway and Sweden in March. It was the first time I took a satellite phone for a multi day hike. I felt it was necessary because if something goes wrong when you are at the heart of Sarek you are quite far away from a safe place. Even something silly as twisting your ankle can get you in trouble when help is far away. There are also not that many other hikers in Sarek. I didn’t see anyone for 3-4 days. I rented a Garmin Inreach via Verreweg. The cool thing is that includes insurance and when you push the SOS button the nearest rescue service will be contacted. I mostly used it to let my family know that I was safe in the evening and they could check my position on a website provided by Garmin. But this is a very important piece of equipment to have when you are out in the wild! I setup a few waypoints of possible campsites, river crossings and specific locations that I could use in case I couldn’t see because of fog, clouds or rain. I used the Maverick app to upload a gpx file of my planned trip. It came in handy to find my way from Namasj up the mountain to Skierfe. There was no trail at all and it was easy just to follow the trail by staying on the line in Maverick. Make sure you always put your phone in flight mode to save precious battery life. In case you need to repair your tent, mattress or any other gear. Spare shoe laces, washing line,…. Take the usual stuff like painkillers and diarrhea pills (in case you eat or drink something wrong). I took antihistamine as well for if the mosquitoes would be very bad and I would have a allergic reaction. Overall I was happy with the gear I brought with me. But I was lucky with the weather and I feel like that if the conditions were not like this it could have been a wet and cold adventure. 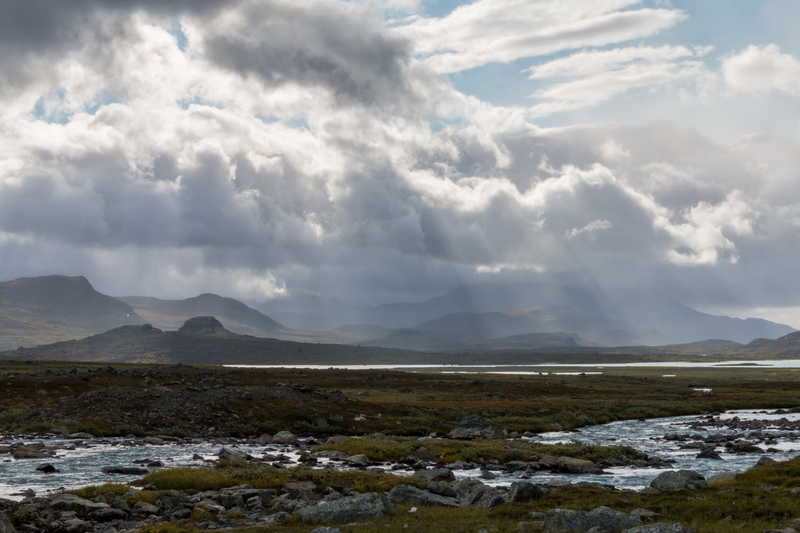 I read some other blogs from Sarek visitors and it seemed they had a lot of rain and wind. The most important items you should bring are a strong tent, warm sleeping bag en waterproof gear including dry bags. Just be prepared! 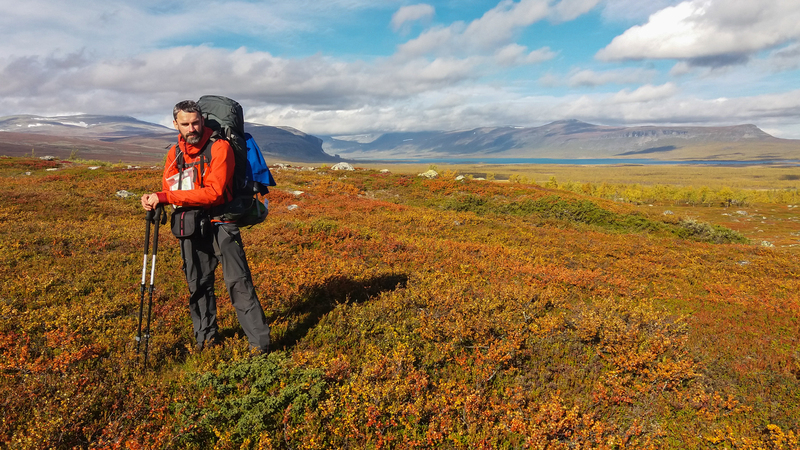 I hope this post helps you plan your trip to Sarek. Feel free to send me a message if you need any advice. Next post will be about food! Very interested to hear about your food packing strategy…me and my husband are going to attempt the big trek later this year!! Hi! Thanks for the comment :-). I am working on the food preparation post. Will be up soon! If you have any other questions about Sarek just let me know. Cheers! Amazing, I am just looking into our food list now for our trip in August. Looking forward to your advice. I wondered what your advice on taking any sort of GPS equipment and what would be your recommendation in terms of whether a sat phone is a necessary item? And did you bring water purification tablets? And lastly, were gas cannisters for your portable stove easily purchasable in Sweden? Hi! Haven’t had much time writing lately but concerning the food the main rule is that you should take light high calorie foods. But probably in the next two weeks I will have something online about it. I took a GPS to navigate in case of very bad weather with rain and fog where it would be difficult to find my way. I also put in some waypoints with specific points like valley’s or rivers and river crossings, possible camp sites and so on. It always good to have that setup in case you need it. A sat phone is a must in Sarek because if something goes wrong you are far away from civilization. I didn’t meet anybody for 3-4 days. You can rent a sat phone that already inclused insurance and data (it costed me about 90 euro for 2 weeks). If you need help you can push the SOS button and it contacts the nearest rescue service. Technicaly they should be there in 30 mins to 1 hour depending on your location. No purification tablets needed in Sarek or anywhere in north sweden, norway, finland. The water is as pure as it can get ;-). No need to worry about carrying a lot of water because it it is very abundant. I never had issues finding camping gas in Kiruna or Gallivare. You can buy them in most outdoor shops or STF huts. I bought mine at the camp site in Gallivare.